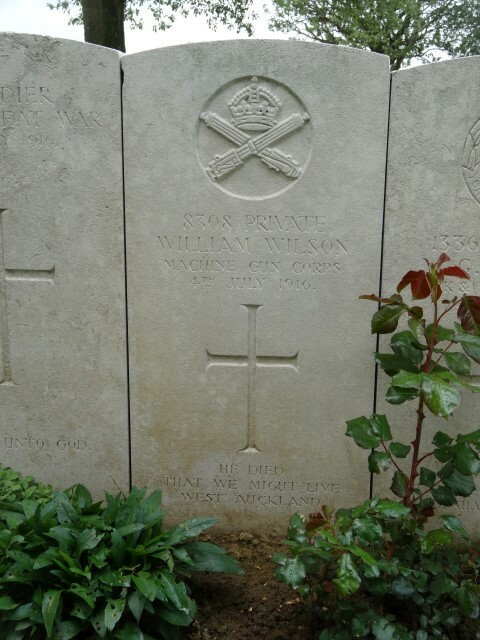 8308 Private William Wilson, 75th Company, Machine Gun Corps died of wounds 4 July 1916 and is buried at Puchevillers British Cemetery, France. He was 24 years old and is commemorated on West Auckland War Memorial and the Roll of Honour, West Auckland Memorial Hall. William Wilson enlisted at Bishop Auckland and joined the Hampshire Regiment and was given the regimental number 19350. Later, he was transferred to the 75th Company Machine Gun Corps being given the regimental number 8308. 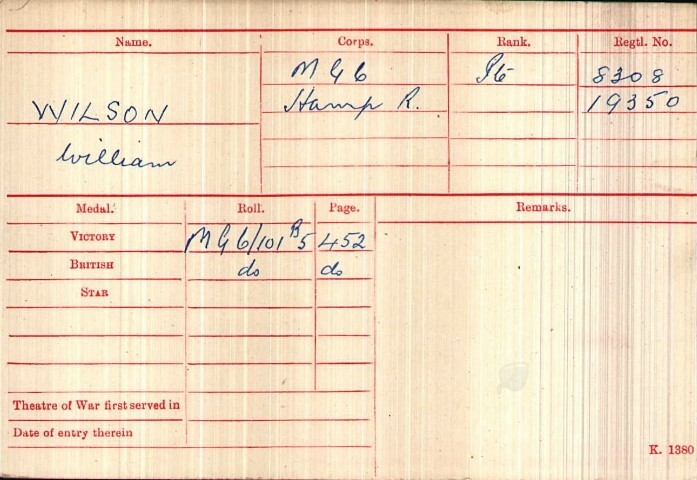 Private W. Wilson’s service record and the 75th Company MGC War Diary have not been researched. 15 March 1916: the 75th Company, Machine Gun Corps joined the 25th Division. The Division saw action at Vimy Ridge in May 1916. It was withdrawn for rest and training near St. Pol then moved to Warloy in the 3rd week of June. It was part of the Fourth Army Reserve for the opening offensive for the Battle of the Somme. 2 July: The 7th and 75th Brigades received orders to move to Aveluy Wood and Martinsart respectively and came under the orders of 32nd Division. 4 July: Private W. Wilson died of wounds. Private W. Wilson was awarded the British War and Victory medals. In June 1916, the 3rd and 44th Casualty Clearing Stations came to the village of Puchevillers and the 2nd/1st South Midland Casualty Clearing Station used the cemetery during July and August 1916. The cemetery contains 1763 First World War burials. England & Wales Birth Index 1837-1915 Vol.10 p.234 Auckland 1892 Q2 Note: there are 3 registrations for 1892 with the name William Wilson at Auckland.